In celebration of the 40th anniversary of the iconic and cult classic musical, The Rocky Horror Show embarked on a year-long UK tour back in December 2018. This week the show strutted into Milton Keynes where it is playing until February 9th. Written as a stage play in 1973 by Richard O’Brien (The Crystal Maze), during a summer of abject boredom, it debuted in London Royal Court Theatre Upstairs. The production was quickly moved to larger venues including The Chelsea Classic Theatre and Kings Road Theatre after becoming increasingly popular. The Rocky Horror Picture Show film (starring creator O’Brien as Riff Raff) followed in 1975 and was produced largely as a parody of the science fiction/B horror movies of the era. The film also starred Meat Loaf, Tim Curry and a young Susan Sarandon in the role of Janet. Despite being critically panned on release, the movie netted $135 million at the Box Office. Sometime during 1976 the film became known as a ‘midnight movie’ where audiences would engage with the film, shouting back at the screen and attending showings dressed as the characters – a trend now synonymous with the stage productions of the show. Rocky Horror is one of the only stage shows where audience participation, heckling and props are not only commonplace but actively encouraged and expected. 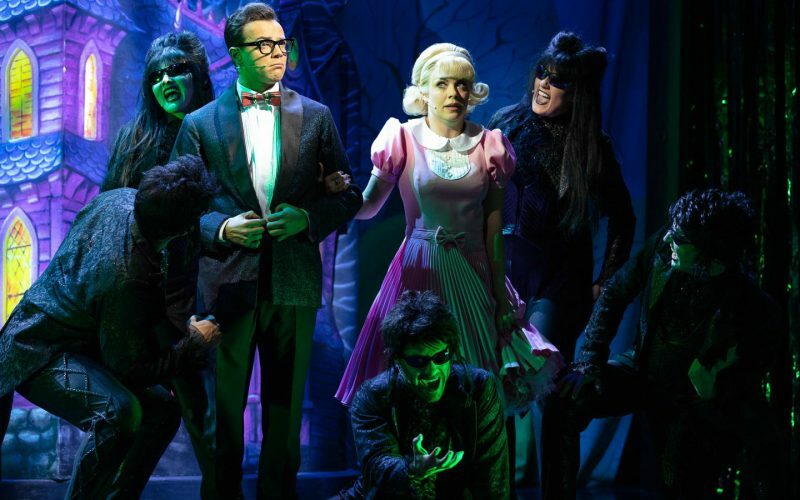 Whilst the standard and performance of the cast are important, Rocky Horror’s success is as much about audience participation as it is about what is unfolding on stage. The plot centres around the newly engaged, super innocent, all-American couple Brad and Janet who decide to embark on a road trip to visit their former college professor. Sometime during their journey, they suffer a flat tyre, forcing them to seek assistance at a nearby castle where they encounter the ‘sweet transvestite’ scientist Doctor Frank N Furter. Arriving during a significant moment for Frank, Brad and Janet are set for a night they will never forget, played out against a backdrop of a toe-tapping soundtrack, an innuendo-laden script and outrageously risqué costumes. 2016 Strictly Come Dancing champion, turned theatre powerhouse Joanne Clifton (Thoroughly Modern Mille, Footloose) takes up the role as the sugar-sweet Janet Weiss. We all know she can dance (and dance well) but goodness she is a true triple threat. With vocals to die for Clifton brings a new dimension to Janet and singlehandedly steals the show. There aren’t many opportunities for her to stretch her vocal cords, but when she does, she does so with abundance. Her rendition of Janet’s famous solo number Touch-a, Touch-a, Touch-a, Touch Me is assured and further enhanced by some fabulous comic timing where she plays off Callum Evans’s buff Rocky. 90’s heartthrob Ben Adams genuinely looks as if he was born to play to role of the geeky Brad Majors. Since his A1 boyband fame, Adams has gone on to establish himself as a musical theatre stalwart, starring in Flashdance the Musical and writing the hugely successful musical Eugenius!, which like Rocky Horror is fast becoming a firm cult favourite with a devoted fan base. Adams embodies the character of Brad beautifully and delivers a stunning solo performance of Once in a While. His chemistry with Clifton is believable and they complement each other wonderfully. The role of The Narrator on the tour is being shared by several actors. Over the years the role has been played by some iconic performers including Stephen Fry, Antony Head and Richard O’Brien himself. Dom Joly (Trigger Happy TV) takes up the role in Milton Keynes and does so with class. Readily prepared for the heckling that was sure to come his way, he was equipped with some fast comebacks, a testament to his comedic background. Kristian Lavercombe has reprised his role as Riff Raff for the tour having chalked up over 1400 performances in the musical joining it on tour in Asia, Australia and New Zealand. It is easy to see why he has been so successful in his portrayal as Riff Raff – his performance is as amusing as it is creepy and he provides arguably the most comedic interludes in the show with his nuanced looks and movement. The iconic Timewarp is where he truly comes into his own, complemented in droves by Laura Harrison as Magenta. Stephen Webb (Jersey Boys, Titanic) steps into Frank N Furter’s basque and platform heels. Whilst his incredibly strong vocals cannot be denied, never more so than when he belts out Frank’s signature tune Sweet Transvestite, he brings unusual masculinity to the normally flamboyant, camp and at times effeminate Frank. He has also made an interesting decision to play Frank with an American accent, which does at times slip. With audience participation such a key ingredient, it was disappointing then to see the house less than half full. As a result, the usual exuberant performance of the Timewarp where the audience jumps to their feet to join in with the choreography was a subdued affair. The same can be said for the heckling, which, save for a small group in the stalls was almost non-existent. Unfortunately, on a wet weekday night in Milton Keynes, the audience just wasn’t at the races, arguably at the detriment to the energy of the performance. This talented cast deserve to be playing to full houses – let’s hope that the audiences of Milton Keynes hastily locate their party spirit and feather boas for the remainder of the week.